"Police officer Agbe Obeid is sentenced to life in prison for having shot Eric Boloko at point-blank range with live ammunition on Sunday, February 25," in Mbandaka, a registry official at the military tribunal in the northwestern city told AFP. "This trigger-happy policeman shot the young man as he was peacefully going home (after a demonstration). I hope that he will really serve out his sentence," said Fabien Mongunza, president of the civil society movement in Equateur province, of which Mbandaka is the capital. "This verdict has calmed people's minds because the tension was noticeable. Military justice has done well to swiftly convict this policeman," Mongunza added. Boloko was one of two people reported killed by security forces during weekend marches in Congolese cities banned by Kabila's regime but supported by the influential Roman Catholic church. The protests were prompted by Kabila's failure to quit power when his second elected five-year mandate expired in December 2016 and by delays in holding elections, now scheduled for the end of 2018. 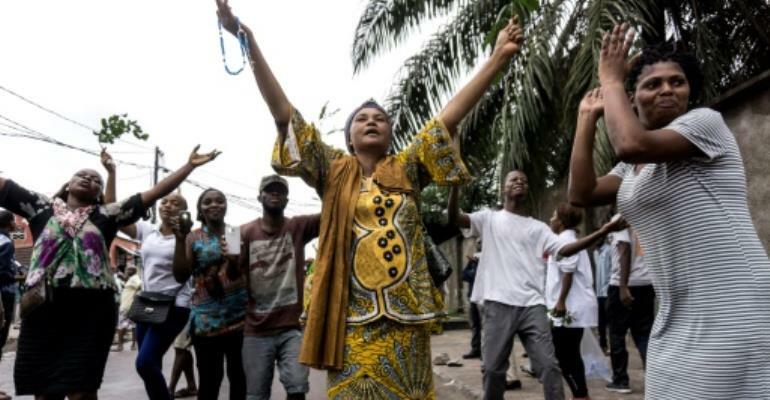 A policeman who on Sunday shot prominent activist Rossy Mukendi of the Collective 2016 citizen's movement in the capital Kinshasa has been arrested, according to police spokesman Colonel Pierrot-Rombaut Mwanamputu. Mukendi died of his wounds, prompting one lobby group, the Congolese Association for Access to Justice, to speak of a premeditated "assassination". Anti-Kabila protests on New Year's Eve and on January 21 left 15 people dead at the hands of the security forces, according to tolls given by organisers and the United Nations.